Children from the Wilson County, Tennessee foster care program were granted wishes by Oldcastle Infrastructure employees this holiday season. 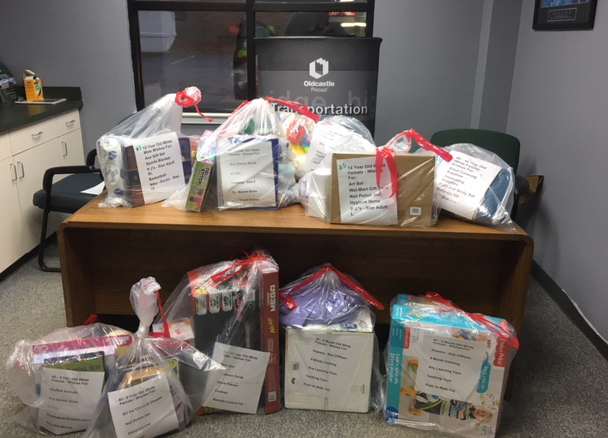 Partnering again with Katrina Hildebrand of the Wilson County, Tennessee foster care program, Oldcastle Infrastructure Lebanon, Tenn. employees happily provided holiday cheer to nine foster children, from three sibling groups, ages 1 through 16. Having five wishes each, the children’s wishes were granted by the employees, who donated their time and resources to provide their requested gifts. Oldcastle Infrastructure is the clear choice for building products and services for North American infrastructure projects. We are a leading provider of engineered product solutions nationwide to a number of market sectors including Building, Water, Communications, Energy, and Transportation.